This event educated participants about mental illness. It also engaged the general public on the topic and erased any misinformation and preconceived notions—all while entertaining all those who attended with a friendly, yet informative, scavenger hunt. The event took place last Wednesday night at the Reitz Union. Dr. West challenged all of us in the audience. She asked us to raise our hands if we knew someone suffering from a mental disorder. Many hands went up, but they slowly came down after her second question. She asked if we’d ever thought to encourage those we know are suffering to see a medical professional. And why, I wonder, did so many hands go down with all the resources across campus? A scavenger hunt game followed. It showed the importance of the past and how it correlates to the present for African Americans. Statements spanning back into the past to explain the pathology of issues affecting the black community were made like, “Slaves who were diagnosed with Drapetomania were treated by being stripped naked and isolated in an unsanitary holding.” Players found statements like these to decide if they were fact or myth. Although the statement is false, and slaves were not isolated (they were savagely whipped), doctors would diagnose blacks with a disease to explain their rebellious behavior in efforts to control them. This explains the generational mistrust built throughout centuries and a recurrence of misdiagnosis—due to a lack of cultural competence displayed by health care professionals. “Save Our Minds, Save Our Lives” gathered people of all religious and racial backgrounds to discuss mental illness on a communal level. Though regarded a serious topic, mental health is often considered taboo within the black community. “It’s something that is just there and nobody wants to deal with it,” said freshman Amber Harvey. From a statistical standpoint, African Americans are 20 percent more likely to have psychological distress than whites—yet are less likely to seek and/or receive professional care. In the present, many of us grow up to believe that we can tough things out—that emotion is not something we must express, that our pain and issues make us weak. Of course, there are other factors such as demographics and beliefs that effect that mindset. But it is one many in attendance could relate to. “We make the erroneous assumption that mental illness is not a condition ‘we’ experience; rather this an issue that happens among other communities,” said West. “… mental illness is something common and shouldn’t be made fun of. People should know that there are resources available for them. Within the university, you have friends, even the Gator Wellness and some professors, some are willing to listen,” said sophomore Chelsey Vincent. “I hope that people will tell how prevalent the issue is. We should be more aware of it. Education is something everyone should take from this event, in order to help someone, get help. 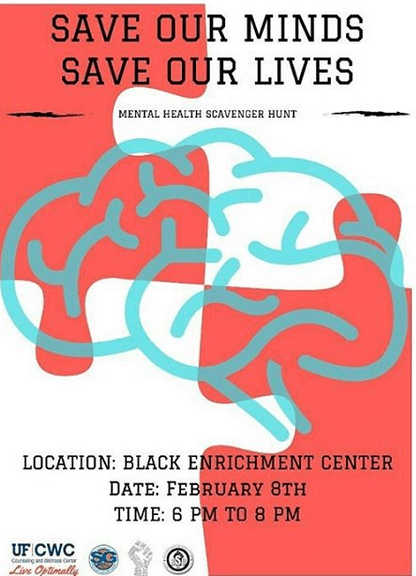 Become educated on mental health,” said BHM’s Program Planner Director Meaghan Sapp. Save your mind. Save your life. Keep your hand raised and get help for whoever may suffer in your life—whether that’s a friend, family member or you.